Strangled Shrine is an unlockable racing area in the game Diddy Kong Racing DS. 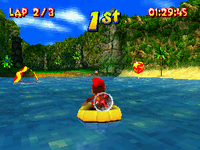 Along with Thunder Cove, Meandering Mount, and Splashdown Pass, it seems to take place on Donkey Kong Island. Unlike the other DK Island race courses, which are at least partially based off of the jungle levels in Donkey Kong Country, Strangled Shrine seems to be based entirely off of the temple levels in DKC, if extremely loosely. There are many differences between the shrine and the temples of DKC, among them are: Kong markings rather than Kremling symbols and the fact that nearly the entire shrine is flooded. As such, the primary racer for the course is the Hovercraft. It can only be unlocked by being bought from Taj in his tent. The track is not featured in the original game. This page was last edited on April 15, 2019, at 15:33.